Number Four (alphabetically) in my list of Best Picture nominees to review is the family drama The Kids Are All Right, starring Annette Bening and Julianne Moore as a lesbian couple whose teenage children find their sperm donor, played by Mark Ruffalo. The movie was nominated for four Oscars, and is a good contender for all of them. Ruffalo as the couple’s sperm donor (and thus, the until-now-unknown father of the family’s two children) gives a good performance, showing a man whose life is turned upside down by the revelation that his $60-a-pop sperm donation has resulted in two living, breathing teenagers. You feel for him, as he seems to be a generally good guy, despite some admittedly terrible choices he makes during the movie. Still, he honestly seems to mean well enough, even if his selfishness sometimes prevents him from considering the impact his words and actions have on other people. Rounding out the cast are the 2010 Alice in Wonderland remake’s Mia Wasikowska and Bridge to Terabithia‘s Josh Hutcherson, who play the teenagers in the middle of all of this. Both are good in their respective roles, though I have to say I think Hutcherson’s portrayal was more nuanced — whether that’s because his acting was more compelling than Wasikowska’s or because the script gave him more interesting character growth is certainly up for debate. The Kids Are All Right is a movie that gay audiences were immediately drawn to, considering the A-list actresses in leading roles as a lesbian couple… But one of the many great things about this movie is that it wasn’t a gay movie, necessarily… Yes, the leads are a gay couple, and yes, there are some aspects of the story that are dependent on the fact that both parents are women, but more often than not the parents’ sexual orientation isn’t made into a big deal. The kids casually refer to “Moms” without batting an eye, and many of the frustrations that Bening and Moore face are completely relatable to any parent of a teenage child. What’s so fascinating about this movie is that it shows two (three?) parents trying to do what’s best for their kids and for each other (while each deals with their own individual issues and concerns) and two teenagers trying to figure out who they are while all of this family drama swirls around them. There aren’t brainy plot twists like Inception or shocking developments like Black Swan, but the story is inherently relatable to anyone who’s been a parent, a teenager, or a “significant other” in a committed relationship. It’s easy to see yourself in many of these characters, which makes it feel like a movie about the many aspects of yourself. 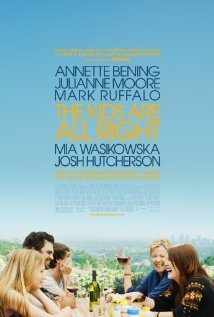 The Kids Are All Right is intriguing, heart-warming, heart-renching, laugh-out-loud funny, and tear-jerking, all in under two hours. Definitely see it, preferably with family, significant others, or other loved ones. It’s definitely a movie to enjoy with people to whom you feel closest. This entry was posted on Friday, February 18th, 2011 at 6:48 pm and is filed under Uncategorized. You can follow any responses to this entry through the RSS 2.0 feed. You can leave a response, or trackback from your own site.